This sleek bracelet watch from luxury Swiss watchmakers Tissot combines sophisticated watch technology with contemporary styling. Boasting a stainless steel case and bracelet, a bold black dial and three sub dials. Complete with chronograph, date function and tachymetre. 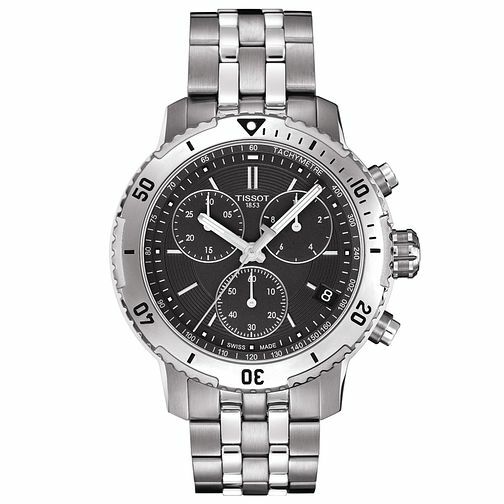 Tissot Men's Stainless Steel Bracelet Watch is rated 3.0 out of 5 by 2. Rated 1 out of 5 by Anonymous from Worst customer service by Ernest Jones I have order the product 5009626 and you send me wrong watch for delivery, i have rejected the product in store it self and returned there. Please check the items your sending to the customers before delivery, they will be very upset as they buying products for their loved ones.